If you’re nearby, Warwick Castle is definitely somewhere you need to visit if you haven’t already. Originally built in 1068 by William the Conqueror, this motte-and-bailey castle was originally made of wood until it was rebuilt from stone in the 12th century. There’s so much history surrounding it which is great for the adults but there’s definitely more for the kids. We were really lucky with the weather, the sun was shining for most of the day and it was actually warm. 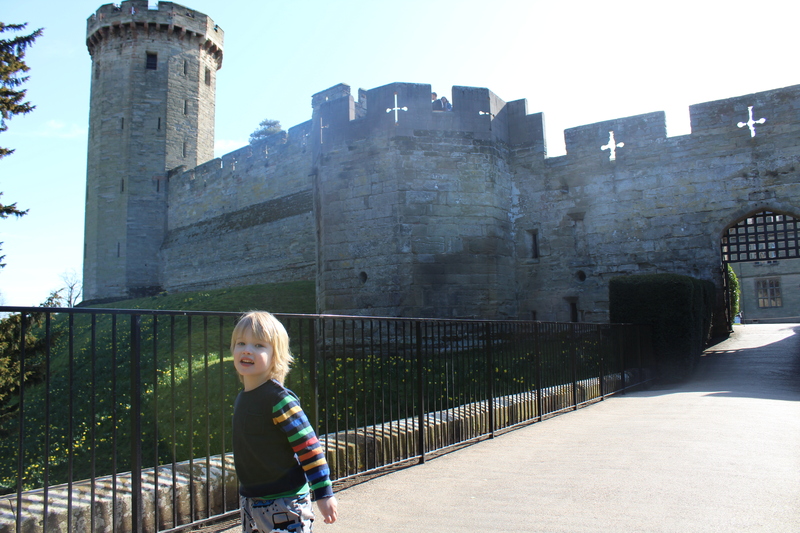 The castle and grounds aren’t huge which meant both the boys could walk around by themselves. We had tea and cake surrounded by peacocks, climbed a huge tower which easily had around 200 steps to go up and down and we also caught the tail end of a birds of prey show. They’ve got a massive trebuchet (catapult) in the grounds which does get fired sometimes, just unfortunately not yesterday when we were there. We had a voucher from the Kellogg’s cereal packs which gave us one free adult entry so for one adult and one child (Archie was also free), it was £36 which I expected as I’d already done research. However, nowhere on the website that I could see did it say you also had to pay £6 parking, that was a lovely surprise to be greeted with. That made our overall entry cost £42. The tea and cake in the Conservatory tearoom was £18.15 which while I agree it’s a bit steep for 4 cakes, a flat white and a pot of tea, the views and weather were totally worth it. Gareth spent £20 on a knight’s outfit for Henry and a small eagle for Archie (they didn’t have a dress up outfit small enough for him) and we got a magnet for £4. It is a lot of money but it was one of those days out that we’ll remember for a long time. Next: Next post: Easter 2018 – which egg hunts did we go on?